My shoulders and upper arms are fried, this was a tough workout for me. I struggled with doing the presses and ended up doing 20 strict presses and then the last 8 as push presses (it still amazes me how much a little hip thrust will get a bar over my head). And the 33 lb bar felt so light at first but after 10 reps, my shoulders were screaming. The kneeling alternating row was interesting- I can definitely see how this would help in bike handling and using one side or the other to help you turn and balance. 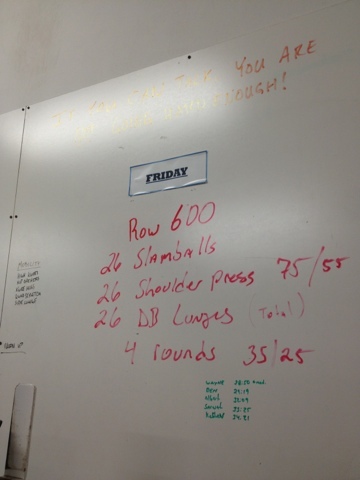 Notice the board says 26 reps, for some reason I did 28 reps which means I did 24 extra reps! I feel both cheated and exhilarated that I pushed harder!